When I was in elementary school, my father got an unusual assignment. He was an Army officer at the time, a veteran of both World War II and Korea. This tour of duty would be different. He’d be a military attaché. Kind of like an ambassador, only with a uniform. We’d all be moving to Costa Rica. Costa Rica? Where’s that? I remember wondering, because this was well before Central America was on anybody’s radar as a great place to honeymoon. When I told my teacher, she corrected me. “You mean Puerto Rico,” she said. No, I did not, but she still knew better. So we sailed off to Central America from New York in a Navy ship that stopped in Puerto Rico and Cuba before docking in Panama. Then we took a plane to San José, Costa Rica, where we lived for three years in a very large house with five servants and a chauffeur. Among my friends were two girls whose father was the American ambassador. They lived in a mansion that made our house look like a cabin. As unlikely as it may seem — this was the early 1960s — their residence in the hills west of San José in San Antonio de Escazú was a replica of Tara in Gone with the Wind. Enjoying the hospitality of my friends, I stayed overnight a couple of times in this magnificent abode. I was also on hand for a fabulous Fourth of July celebration hosted by the ambassador and his wife. They invited every American in the country to come and enjoy real gringo hot dogs on their expansive lawn. We all dressed up like cowboys and plugged our ears during the fifty-gun salute honoring the admission of Alaska and Hawaii to the union. To be fair, the author of the article was quoting the hotel’s general manager, but it was disappointing that she failed to do a little fact checking. Because now, since the Tico Times’ story is the only bit of “history” about Costa Rica’s Tara readily available on the Web, it has gained the power of fact, even though it’s total fiction. Because I knew that Tara had been there at least twenty years before “an Austrian baron” had nothing to do with its construction, I dug into some newspaper archives. These are also available online, but they’re not always free for the perusing. It cost me $79 for the right to look up old stories for a year on newspapers.com. 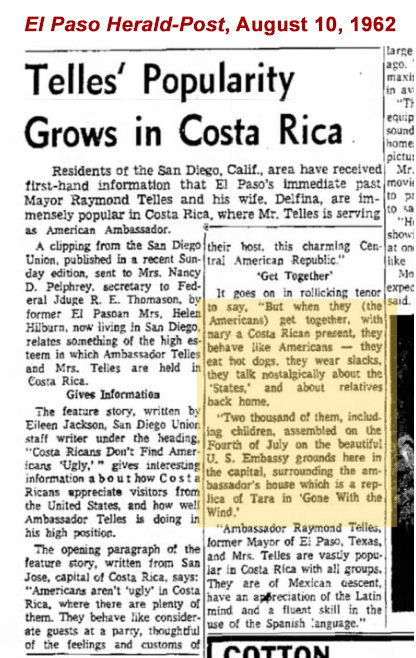 It wasn’t long before I found a story in an El Paso newspaper in which Delfina Telles, wife of Ambassador Raymond Telles, described the Fourth of July party she and her husband hosted back in the early ‘60s at their residence, a replica of Tara in Gone with the Wind. More sleuthing led to the discovery that the American government leased the property from another American to serve as the Telles’s residence. I stopped there, having found the evidence I was looking for. I still don’t know who built Costa Rica’s Tara, but I am willing to bet that its creator was far more likely an American (Frankly, who else would give a damn?) than “an Austrian baron.” Maybe someday before my newspapers.com subscription runs out, I’ll find out more. In the meantime, I hope I have corrected a bit of fake news that was becoming a bit of fake history. I also hope I have not introduced any new errors by referring to old newspaper stories that may or may not be accurate. I do trust my memories of enchanted sleepovers, my gracious hosts, and a Fourth of July celebration I’ll never forget. I’ve heard some of these stories of Megan’s adventures in Costa Rica, over the years, I am glad she is now sharing some of them in print. Glad you’re not sick of them, Mark! Your $79 damn giving made my day! Thanks, Holly! Now that I have a year’s worth of access, I’m going to dig around more in ancient news. Send A consulting bill to the Tico Times for doing their job for them. Charge enough to cover the subscription and a nice trip to Costa Rica for you and Mark. 😀 Great idea! I’m packing my bags today.